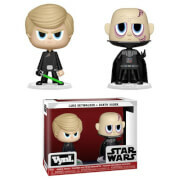 Inspired by the urban, stylized look of modern vinyl figures, Funko has outdone themselves with its line of Star Wars Pop! 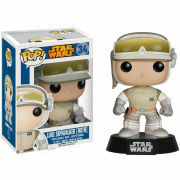 Vinyl bobble heads, and this Star Wars Pilot Luke Skywalker Pop! Vinyl Bobble Head is no exception! Modeled after Mark Hamill's Luke Skywalker as he takes control of the X-wing fighter from Star Wars Episode IV: A New Hope, this detailed and exquisitely designed bobble head stands 3 3/4-inches tall. When you see just how cool Pilot Luke looks in his pilot outfit you'll want to collect the rest in this line of Funko Star Wars vinyl bobble heads. The Star Wars Pilot Luke Skywalker Pop! Vinyl Bobble Head comes in a displayable window box, so it'll look great sitting next to the rest of your Star Wars collection! Ages 5 and up.